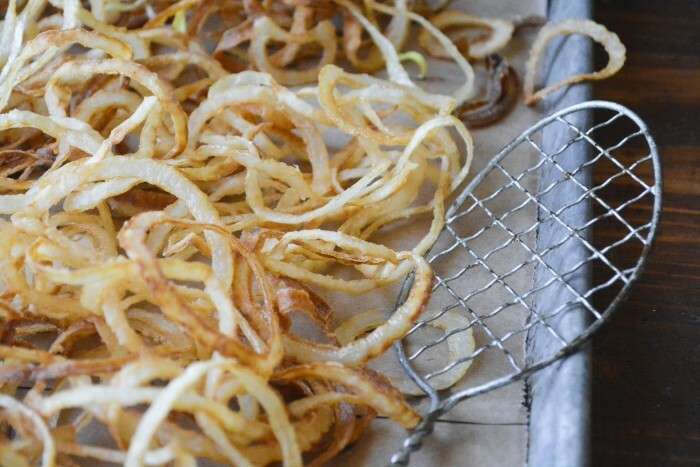 Easy Onion Strings are flash fried ultra thin slices of onion and they are dangerously easy to make! 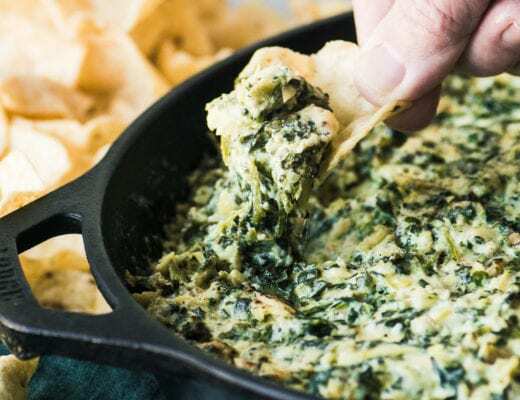 Serve them up as an easy appetizer or side for all your burgers and sandwiches. I have an ongoing love affair with onions strings because they’re easy and dependable. And freaking delicious. As long as you slice your onions thinly, dust them with a little seasoned flour, and get your oil nice and hot, they’ll come through for you time and again. That’s a lovely and rare thing in the kitchen where so many things can and do go wrong, so many things are complicated beyond comprehension, and too many things are a disappointment in the end. 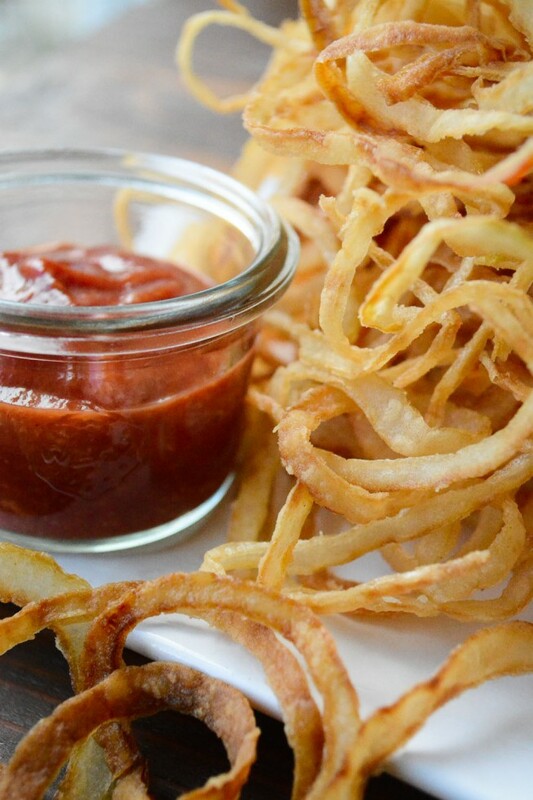 Onion strings will never disappoint. Sweet Vidalia onions happen to be in season so I used them, but you can use any type of onion, red, white, yellow, they’ll all turn out great. 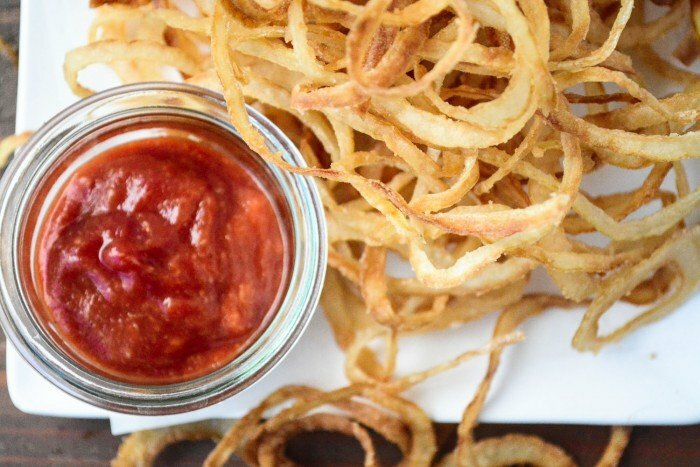 All onions are naturally sweet when you cook them, so I like to serve something tangy alongside to dip them in, it balances out the greasy (and I mean that in the best possible way) sweetness. 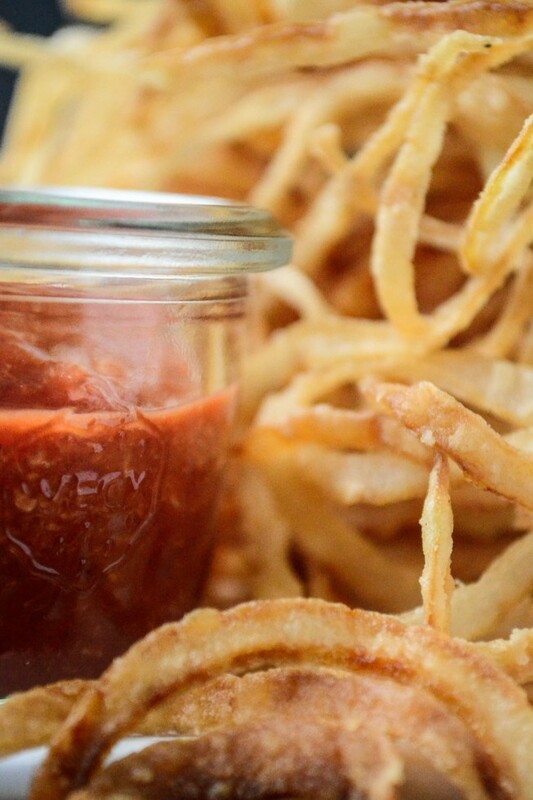 Horseradish ketchup fills the bill. 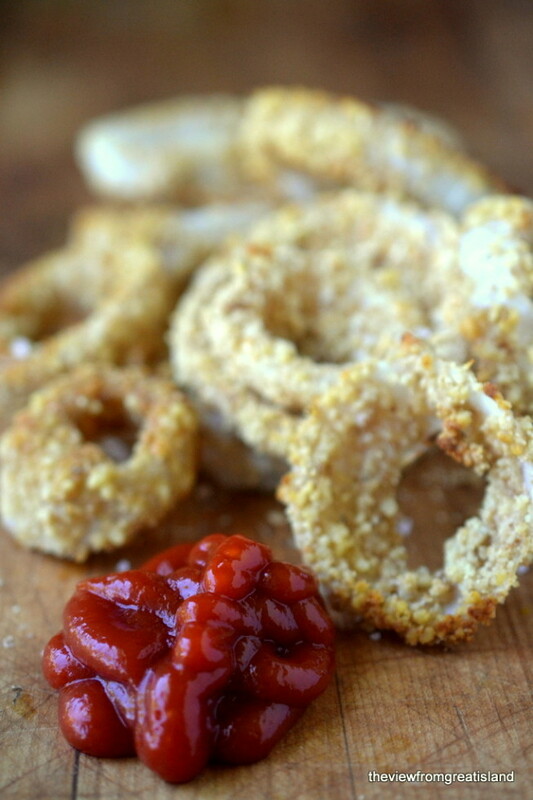 The onions are cut into 1/8 inch slices, tossed in some seasoned flour, and then fried. They come out in a sort of tangled mess, which just gives you license to shovel them into your mouth — there’s no polite way to do it, even if you try to grab just one ring, seventeen more will cling onto it for dear life. Just go with it. For regular onion rings, a good knife is fine, but for strings they need to be sliced thinner than you can accomplish on your own. I use my mandolin slicer, it can slice an onion into perfectly even 1/8″ thin slices in just a minute. 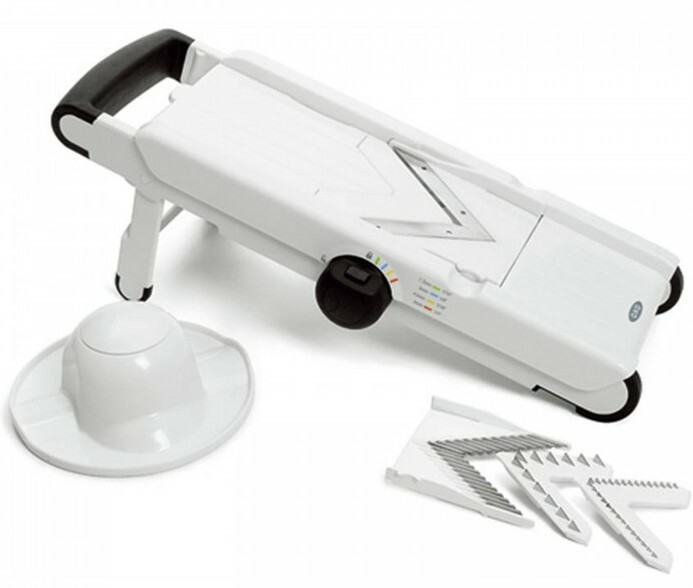 It’s one tool that I think a lit of people don’t have, but is well worth getting, and it’s not very expensive. 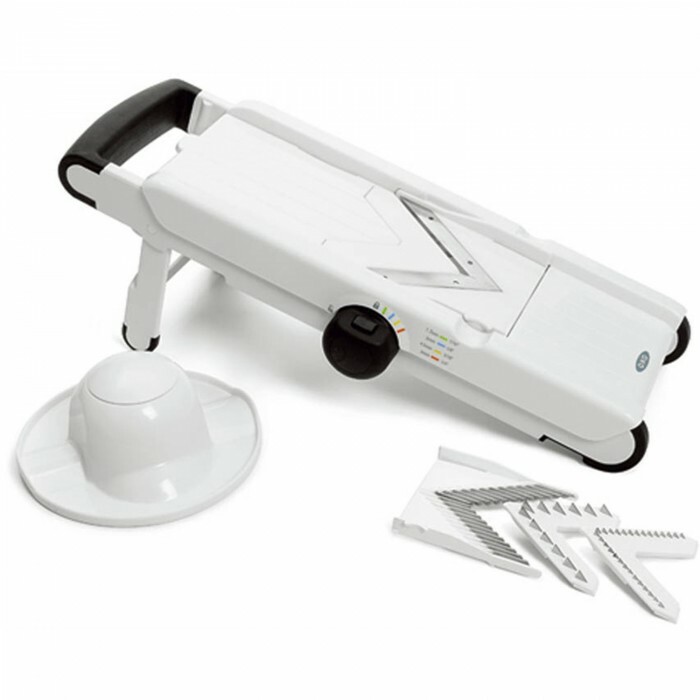 I use it not only for onion strings, but for slicing potatoes for chips, fries, and gratins. I do peppers and cucumbers for salads. You can do paper thin beets and radishes, too. If you have any left, pile them on top of a burger! Slice the very top off the onion and peel just the outer layer of skin, leaving the root end intact. Slice it on the 1/8 inch setting of a mandolin slicer. Gently separate the slices into individual rings. 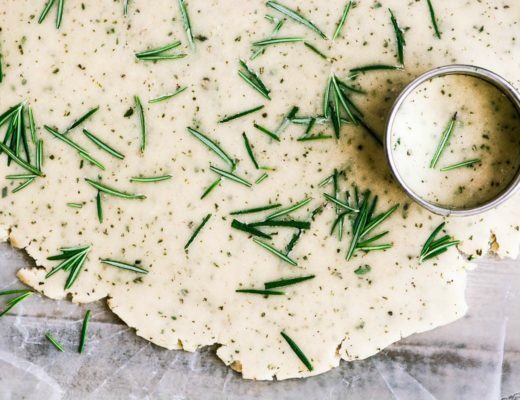 Whisk the flour and the salt together in a bowl. Working in batches, toss the onions into the flour and coat completely. Shake off excess and drop into the hot oil. If you are not using a thermometer, drop in a test onion...if the oil is at the correct temperature, the onion should fry to a golden crispiness in about two minutes. If it browns immediately, the oil is too hot. If it doesn't turn golden in two minutes, it needs to be hotter. Remove the onions to a paper towel while you do the rest. Serve right away, with horseradish ketchup on the side. To make the ketchup, blend the two ingredients together. 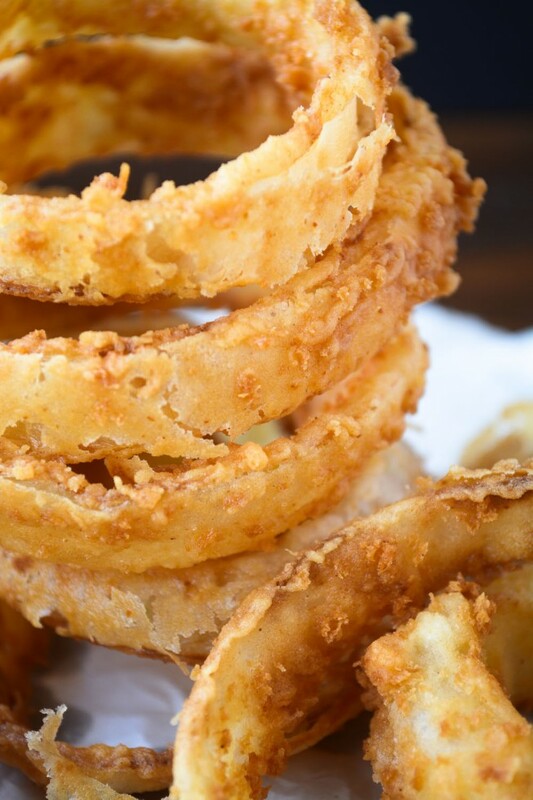 I’ve been wanting to try onion rings since the last time you posted them and made my mouth water, Sue! Now these! I am a true onion devotee and can’t wait to make them. You are an onion ring freak! And that is more than OK by me! Well, I’m gobsmacked! I didn’t know there were so many ways to fry onions! We don’t tend to do it do much in Australia. 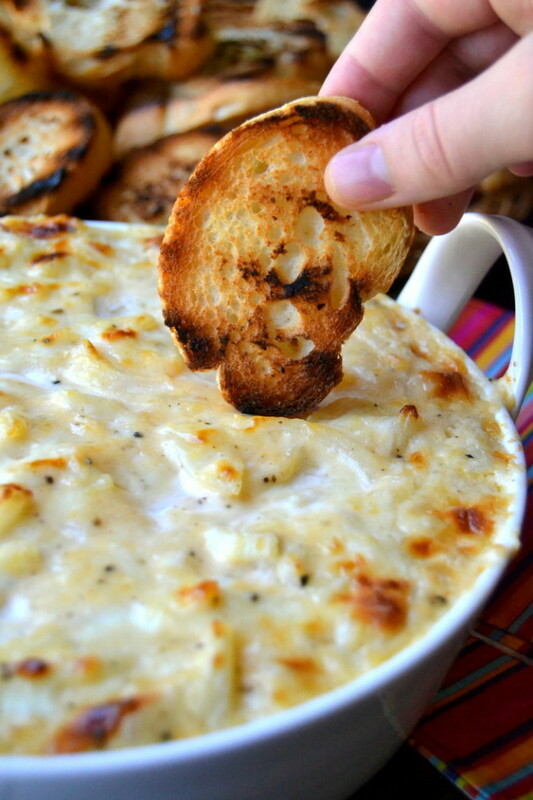 This post is timely, as I was just in the mood for something oniony – I was thinking French Onion Soup, but your dip looks amazing! Thanks for the ideas! My husband absolutely loves onion rings. It’s been AGES since I’ve made them. Thanks for the reminder, as I’m heading to Trader Joe’s for vidalia onions anyway. I love these things! I always have to make a double batch — one for the cook, and one for everyone else. ;-) These look terrific — thanks. I was sold with the first photos Sue but on a burger? Irresistible! Thanks for the permission to eat more than one. They would probably never get to the table if I was put in charge of the deep fryer. Remember that if you ever invite me to dinner. Just give me a different job. I’m not to be trusted cooking bacon either, just to be honest. Pinning!!! I see the Tupperware ones here are $95! When did that happen? 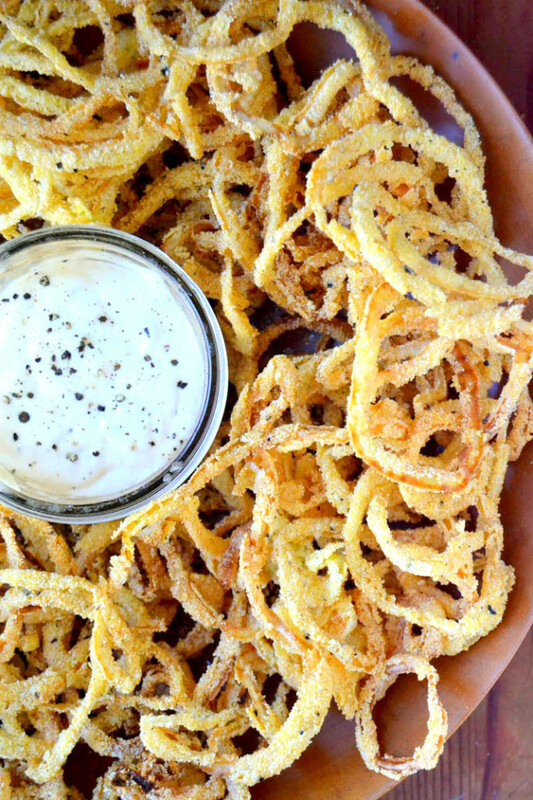 Well now I am seriously craving a big-o-pile of stuff-in-your-mouth fried onion strings! Thanks a lot! Haha :) These look wonderful and I love that dipping sauce – such a fan of horseradish in general. 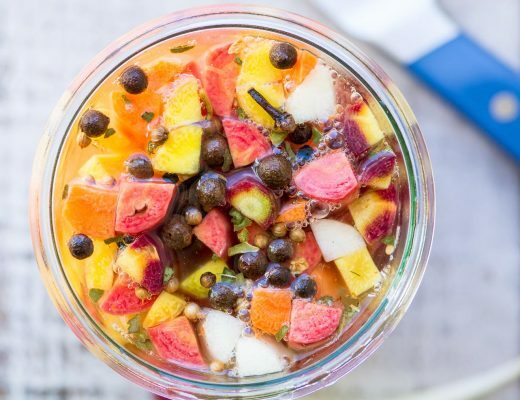 I guess I should have eaten lunch before reading this post – yummmy! And you are so right – two weeks in a row I had a recipe bomb – makes me feel like a looser – so I need to make these and redeem myself! these look so good, my mouth is watering… and it’s nearly dinner time here in the UK. I need to hunt down somewhere I can eat these now! 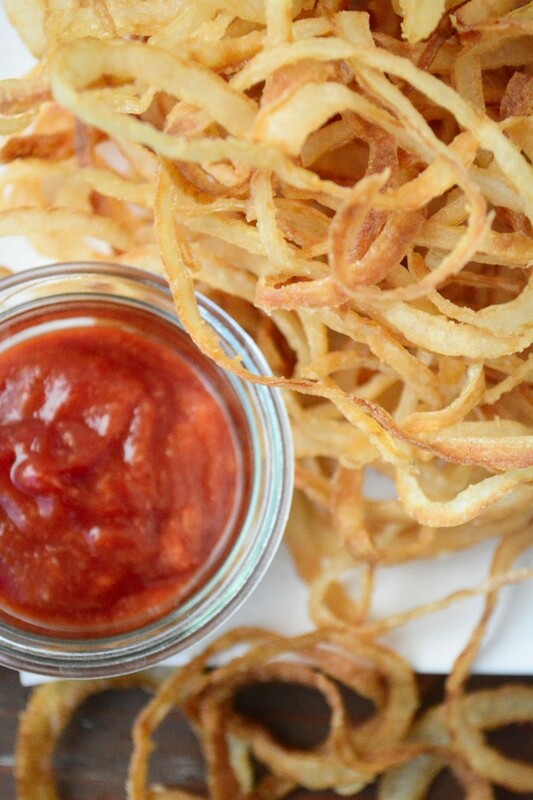 These onion strings look irresistible, well worth the few extra miles I’d have to run ;). Haven’t made onion rings in a really long while! These look very crisp and delicious, Sue. The burger looks so inviting! Yum! 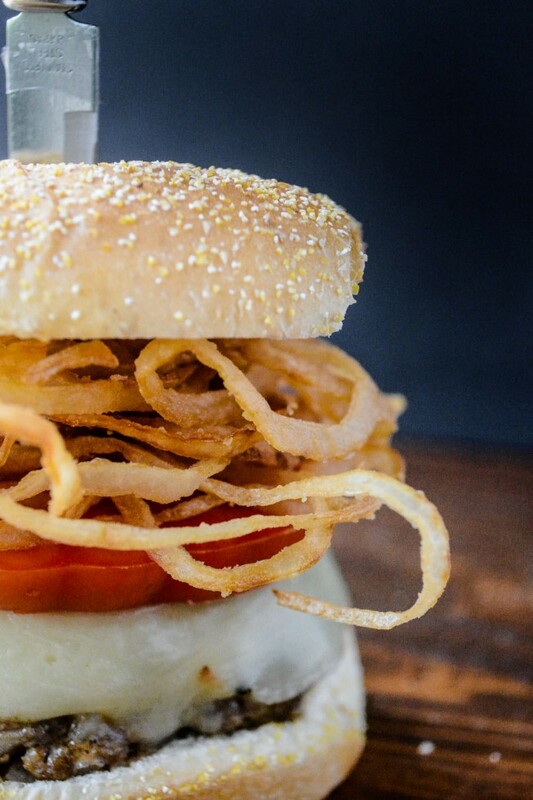 Love onion rings and strings, especially on hamburgers. I do love your ketchup, too :) Pinned! Thanks Jennifer – have a great week!